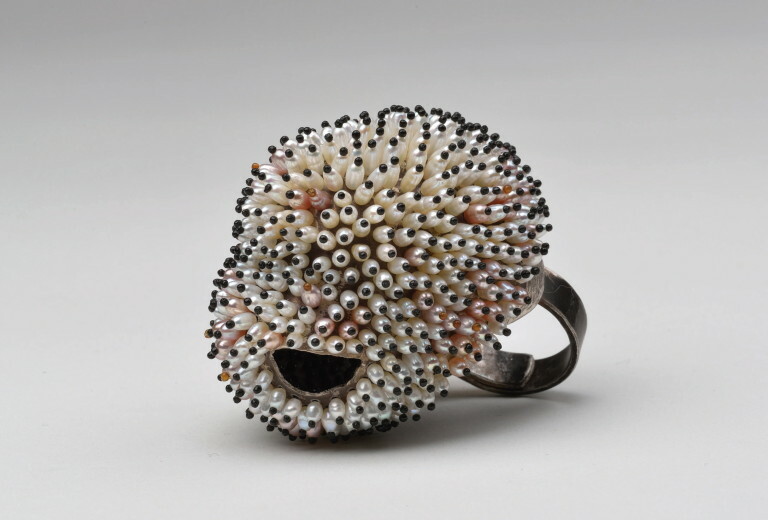 Jewelry between Art and Fashion. Vivacious, opulently colored pieces burst the boundaries between jewelry, fashion and art. Some of them evoke visions of a mysteriously shimmering underwater realm. These necklaces, bracelets, rings and brooches feel cuddly and soft, but are surprisingly sturdy. The godfather of these unconventional creations is named Tzuri Gueta. He had already been celebrated in Paris before 2006, when he patented a method for precisely spraying colored polymer into the most delicate woven fabrics. An ambitious designer, he has worked together with renowned Parisian couturiers, including Thierry Mugler, with whom he first collaborated in 1998. Tzuri Gueta won the Grand Prix de la Création de la Ville de Paris in 2009 and staged a one-man show at the Tel Aviv Museum of Modern Art in 2010. This meteoric Parisian star opened his boutique, which is simultaneously also a gallery and atelier, in 2011. Tzuri Gueta’s creations celebrate their German premiere in an auspicious one-man show at Hilde Leiss’ gallery.